Top publications have featured her work including AD, Coastal Living, Elle Décor, Domino, Garden & Gun, House Beautiful, Southern Living and The Wall Street Journal. Garden & Gun featured Barrie in their article, SOUTHERN WOMEN: A New Generation of Women Who Are Redefining the South. 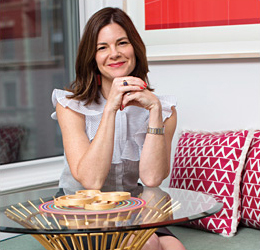 As a graduate of both the liberal arts program at Furman University and the interior design program at the University of Georgia, Barrie’s background includes several years at commercial design firm Hirsch Bedner Associates where she designed interiors ranging from modern hotels in Northern Germany to classic Ritz Carlton's in the deep south. After working for Hirsch-Bedner, she taught interior design to UGA students in the Cortona, Italy program. Upon moving to Charlotte in 2000 she opened her doors at Barrie Benson Interior Design, specializing in both residential and commercial projects. In addition to interiors, Barrie designs a signature line of furniture for Highland House and a line of decorative hardware and accessories in collaboration with Addison Weeks. A true lover of the arts, Barrie is an active board member of the Mint Museum and the Charlotte Symphony and regularly visits galleries and art fairs around the world. When she’s not working on her design projects or indulging in the arts, Barrie can be found traveling with her husband, architect Matt Benson, running around town with her two redhead teenagers, Kay and Billy, or chasing dogs Woody and Otto in Chautauqua, NY.